Bringing a so-called micro-pig into your life is a long-term commitment. "Micro" is just a marketing term. These potbellied porcines are also known as teacup and miniature pigs. If you purchase a piglet, your only guarantee is that the creature won't stay small for long. Full-grown miniature pigs reach sizes comparable to those of medium or large dogs -- and their life spans are about the same. Sows generally give birth to litters of between six and eight piglets -- although it can be twice that number. Babies nurse until approximately 6 weeks of age, starting solid food at about the age of 1 month. By 6 weeks of age, they can be weaned and spayed or neutered. That adorable piglet will likely weigh between 50 and 200 pounds when full-grown. Ask the breeder to let you see the parents; ask how old they are. That gives you a reasonable idea of how big your little pig will grow. Finding out the age of the parents is important, because pigs can reproduce before reaching adult size. Pigs reach adolescence, or sexual maturity, early on. Male pigs can reach puberty as early as 3 months of age, while females are able to reproduce between the ages of 4 months and 5 months. Every three weeks, sows go into estrus, which lasts between two and three days. Have yours spayed or neutered before reaching sexual maturity. Boars not only become aggressive, they also emit a terrible odor. Sows often forget their housebreaking and can become destructive. Intact sows who aren't bred are prone to uterine cancer in later life. 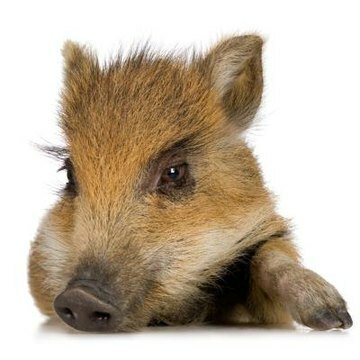 By the age of 3 years, miniature pigs are full-grown. Only then will you know exactly how large your micro-pig will be. If you don't want any surprises, choose a pig that's 3 years old. By the age of 10, your pig is a senior citizen. Keep your pet at a healthy weight and give him adequate exercise. Geriatric pigs often suffer from constipation issues, but regular exercise helps keep them regular. Older pigs might develop vision problems, but since pigs don't possess strong eyesight to begin with, their other senses usually make up for this. Arthritis frequently affects older pigs. Ask your vet about joint supplements that might ease discomfort. With good care and luck, a pet pig might live to age 15 or older. The supply of miniature pigs available for adoption far outweighs the demand. According to Ohio State University, the most common reason that people surrender their pigs for adoption was that the pigs wound up growing larger than expected. Pigs like the company of other pigs, so if you're adding them to your household, get at least two. Before adding pigs to your household, make sure that you're allowed to keep them in your town. Cities and suburban towns usually don't permit livestock. Zoning restrictions are another major reason pigs end up at shelters.